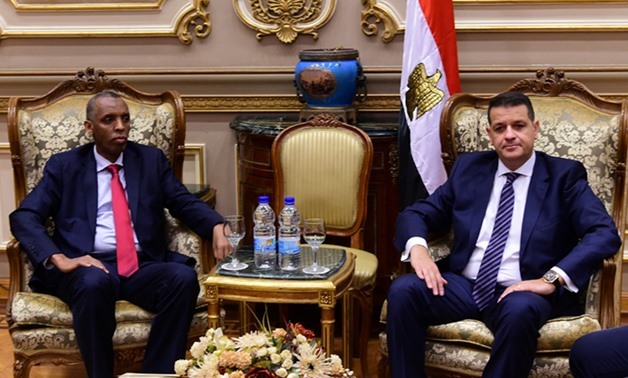 CAIRO - 6 December 2018: Djibouti Ambassador Mohamed Zohr Harsi revealed on Wednesday, Dec. 5 that his country granted Egypt 1 million square meters to establish a logistic zone to be an exportation base to many African countries. The ambassador said in a meeting with the African Affairs Committee at the Parliament that the bilateral cooperation agreements between Egypt and Djibouti can be activated. “Maybe there were some circumstances that hindered the activation of such agreements but now both countries are cooperating. We will soon witness the outcome of such cooperation, fostered by President Abdel Fatah al-Sisi,” Harsi said. The ambassador praised Egypt for allocating a passage for Africans at the border control of Cairo International Airport to speed up their measures adding that Djibouti is always eager to attend events hosted by Egypt. He also expressed his happiness that Egypt will chair the African Union (AU) in 2019. Harsi highlighted that both countries must overcome obstacles impeding trade and economic partnership. He said transportation is the main obstacle because of the lack of direct flights and maritime transport. The ambassador demanded that Egypt establishes an Azhar-affiliated institute, and branches of the Egyptian universities in his country; that is in addition to supporting pre-university education, stressing that his country is ready to allocate the necessary lands, and facilitate all measures. Harsi stated that his country’s disagreements with Eritrea are coming to an end, and that bilateral meetings are taking place to resolve issues. Committee Head Tarek Radwan promised the ambassador that he will communicate with relevant governmental bodies and that the committee is ready to accept any invitations by Djibouti Parliament to discuss bilateral files and boost cooperation in all fields. Abol Khair added that Egypt is ready to share its experiences in different fields including energy, and the medical sector, especially the elimination of hepatitis C.